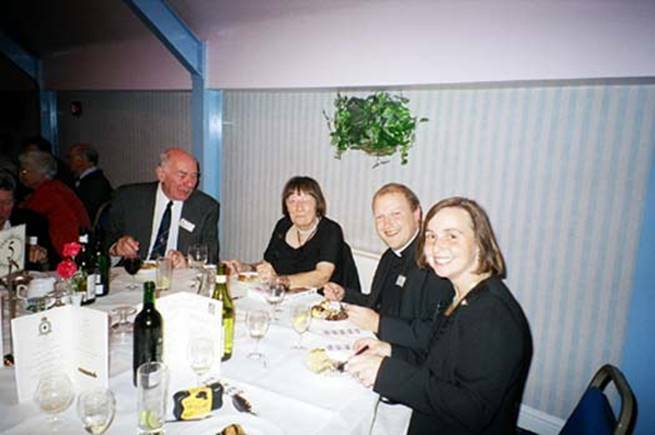 This photo shows (left to right) Vic Savage, Ann Savage (Secretary of the Association), Revd (Squadron Leader) Jonathan Beach (Padre, RAF Coningsby) and his wife. 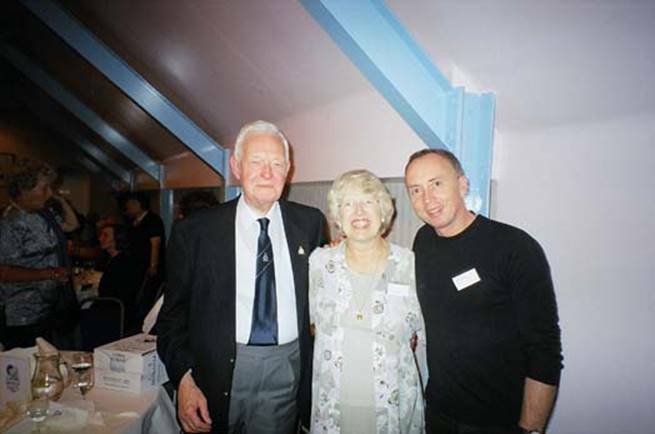 Arthur Tindall DFC (left), Jean Berry, and Rod Parker (right). 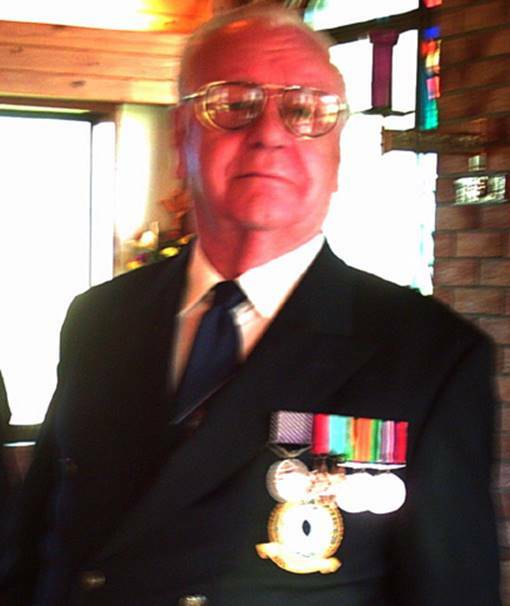 Arthur was a wireless operator with 97 Squadron during the 1943-44 period and completed a double Pathfinders tour of 45 operations. 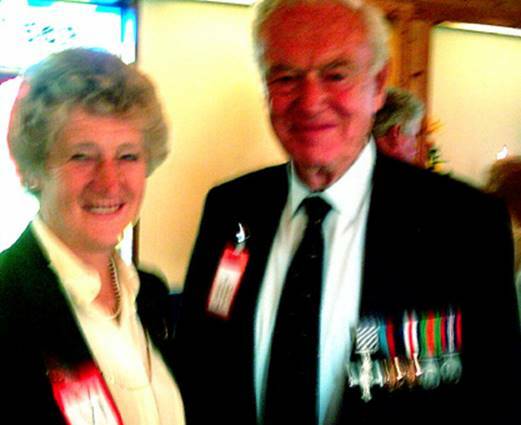 Jean is the sister of the late Pilot Officer Jackie Westgate RCAF, an air gunner who was killed in action in July 1942. 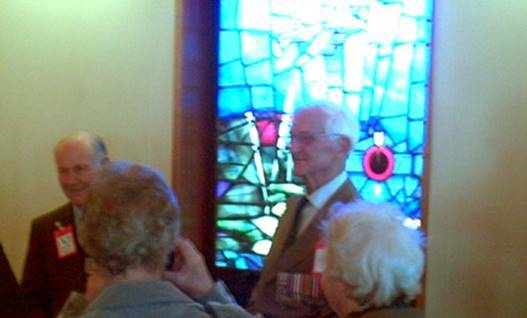 Jean, and her daughter Lynn, travelled from Canada for the reunion and to attend the dedication ceremony for the stained glass window. Rod is the son of Squadron Leader Noel Parker DFC & Bar, one of the Squadron's distinguished pilots during 1944-45. 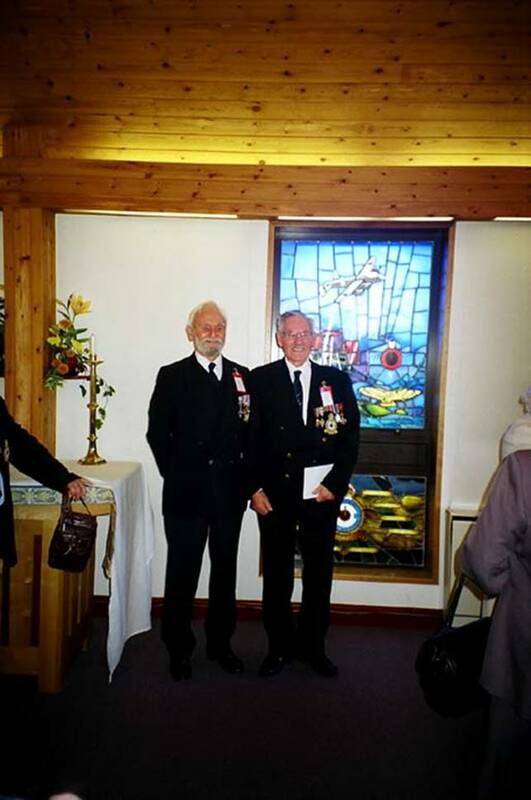 Reunited - Bob Lasham DFC & Bar (left) and his rear gunner Joe Cope (Croix de Guerre) standing by the stained glass window. 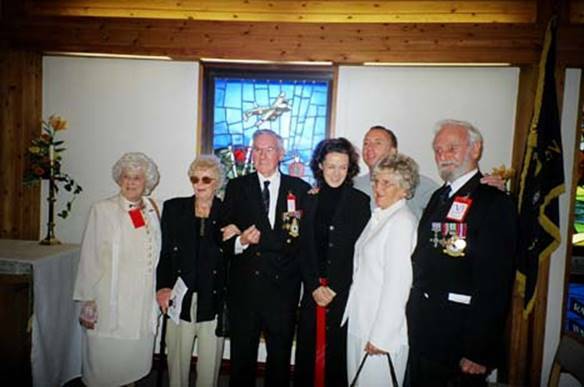 (Left to right) - Mrs Bosley (widow of Bob Lasham's navigator), Mrs Cope, Joe Cope, Suzy (partner of Rod Parker), Rod Parker (son of S/L Noel Parker DFC & Bar RAAF), Mrs Billington (companion of Bob Lasham), Bob Lasham DFC & Bar. 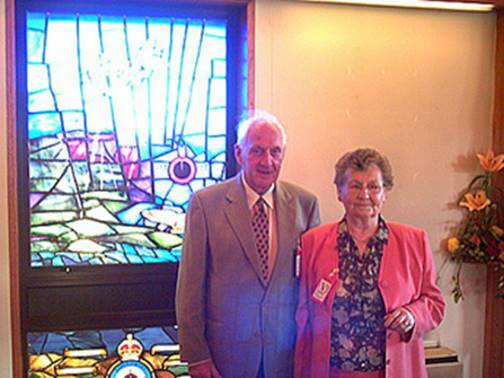 Eric Brown and his wife, Phyllis, standing in front of the new window dedicated to the Squadron. General view of the interior of the church at RAF Coningsby. 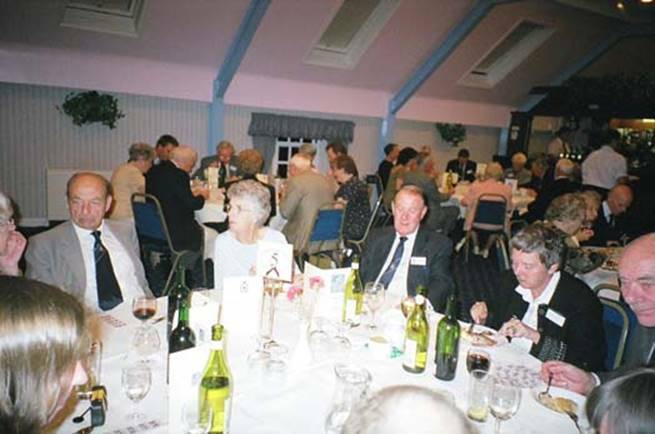 In the centre at the rear is Wing Commander Ken Cook DFC, the Chairman of the 97 (Straits Settlements) Association. Joe Cope,who flew as rear gunner in Bob Lasham's crew, and completed 59 operations in two tours (the first on Stirlings with 149 Squadron and the second with 97 Squadron). Joe's medals are (left to right) the 1939-45 Star, Air Crew Europe Star (with France & Germany Bar), Defence Medal, The War Medal, Police Long Service & Good Conduct Medal (Joe is a retired Police Inspector) and the Belgian Croix de Guerre (with Palm). Bill Eaton DFC & Bar standing in front of the window. 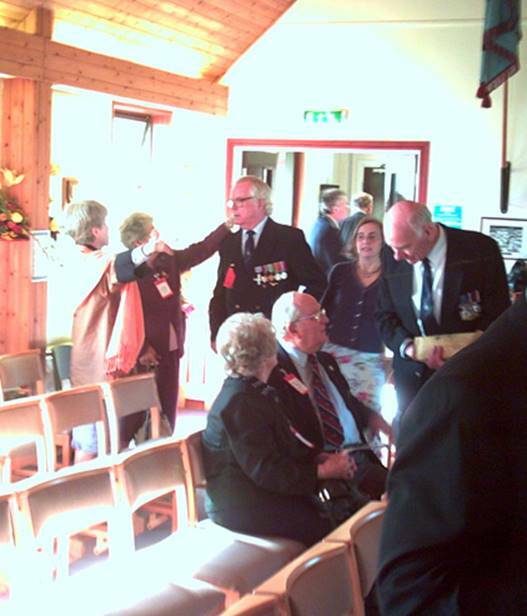 To the left (slightly obscured) is John Spriggs DFC, who was Bill's Wireless Operator. S/Ldr James White DFM who joined the RAF in 1941 as an AC2 and retired from the service in 1973. 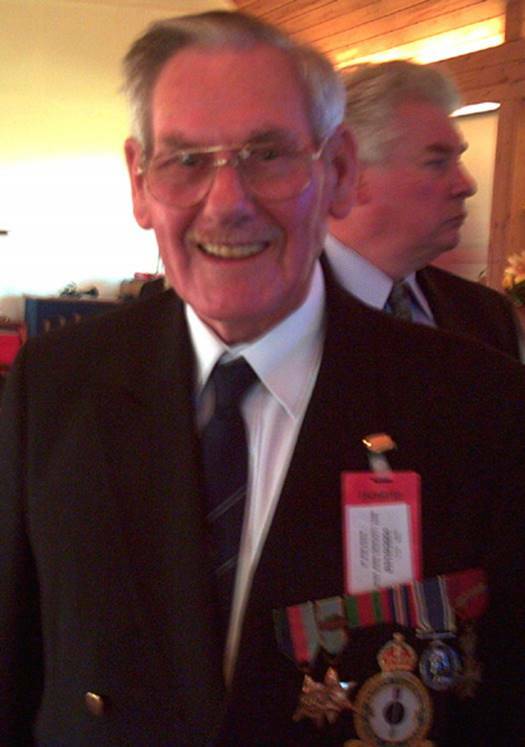 James completed 45 operations as an air gunner.